SEATTLE--(BUSINESS WIRE)--Sep. 17, 2014-- (NASDAQ: AMZN)—Amazon today introduced the all-new Fire HDX 8.9, which combines a startlingly light design and stunning HDX display with a new, more powerful processor, exclusive Dolby Atmos and the latest Dolby Audio, and all-new Fire OS 4 “Sangria” features and services. The new Fire HDX is available for pre-order starting today for just $379—learn more at www.amazon.com/hdx. Powerful 2.5 GHz processor with a 70% faster graphics engine for exceptional speed and fluidity, especially for graphically-intensive games. Exclusive HDX display with incredible pixel density (339 ppi) and perfect 100% sRGB color accuracy—now with Dynamic Light Control, which makes the pages of a book more closely resemble a real piece of paper in different lighting conditions. Startlingly light design—20% lighter than iPad Air. Exclusive new audio—twice as loud as iPad Air, with crisp, clear sound and no distortion; plus Fire HDX is the first tablet with Dolby Atmos. Fastest Wi-Fi, with support for 802.11ac MIMO which delivers up to 4x the peak bandwidth. Available with ultrafast 4G LTE wireless. New Fire Keyboard is the thinnest and lightest full-featured tablet keyboard, with a trackpad to make productivity and navigation easier than ever. Powered by the latest version of Fire OS—Fire OS 4 “Sangria”—with hundreds of new and upgraded features, platform updates, and Amazon-exclusive services. Family Library lets all members of your household access your apps, games, audiobooks, books, and Prime Instant Video content, even if they use a different Amazon account. Free, unlimited cloud storage for photos taken with new Fire tablets, automatically backed-up wirelessly. Front-facing HD camera makes it easy to stay in touch with Skype; 8MP rear-facing camera allows for high-resolution photos and 1080p HD video, and includes an LED flash, Electronic Image Stabilization, and a wide-aperture f/2.2 lens. The Camera application also allows customers to capture panoramas, lenticulars, and HDR recommended shots, and the film strip gives access to recent photos and videos, along with the ability to view, edit, share, and delete right from the camera. Firefly lets you quickly identify printed web and email addresses, phone numbers, QR and bar codes, plus over 100 million items, including movies, TV episodes, songs, and products. ASAP (Advanced Streaming and Prediction) predicts which movies and TV episodes you’ll want to watch and buffers them for playback before you even hit play, so videos start instantly. The Mayday button delivers revolutionary live tech support—one touch connects you to an Amazon expert who can guide you remotely through any feature—24x7, 365 days a year, and it’s free. Nearly 75% of Fire HDX and Fire phone customer questions now come via the Mayday button. Fire HDX is the first tablet powered by the most advanced quad-core Snapdragon 805 processor, with each core running at up to 2.5 GHz. With the updated CPU and a 70% faster GPU than the previous generation Fire HDX, the all-new Fire HDX provides fast and fluid gaming and video. With 30% more pixels than iPad’s Retina display, Amazon’s exclusive HDX display combines exceptional pixel density (over 4 million pixels, 339 ppi) and perfect color accuracy (100% sRGB) resulting in the most lifelike images. The HDX display features Dynamic Light Control, which changes the white point of the display based on the ambient light of the surroundings in order to make the page of a Kindle book more closely resemble a piece of paper—this makes the best reading experience on a tablet even better on the new Fire HDX. Dynamic Light Control will be enabled starting later this year as part of a free, over-the-air software update. Fire HDX is twice as loud as an iPad Air, delivering crisp, clear audio without distortion. The new Fire HDX is the first tablet with Dolby Atmos, which creates a new mobile headphone experience with multidimensional sound that flows above and around you. In a movie with Dolby Atmos, sound moves around you to match what you see on the screen—rain on a roof, airplanes taking off—so you’ll hear the sounds where they would be in real life. Fire HDX is startlingly light, 20% lighter than iPad Air. Weighing just 13.2 ounces, Fire HDX’s frame is made of a single piece of machined magnesium with a blend of glass and nylon molded onto the unibody to create openings for the antennas and maximize signal strength without sacrificing weight or durability. Even with a faster, more power-hungry processor, Fire HDX delivers incredible battery life—up to 12 hours of reading, surfing the web on Wi-Fi, watching videos, and listening to music—without adding weight or thickness to the design. The new Fire HDX also has weeks of standby battery life, so you don’t have to worry about waking up in the morning to find your tablet battery depleted because you forgot to plug it in. This standby battery life is made possible by combining power-efficient hardware components, low-level software improvements, and a new feature called Smart Suspend. Smart Suspend develops a device-specific profile for when the tablet is typically not in use and proactively turns wireless off and on to save power. Smart Suspend will still turn on Wi-Fi periodically to fetch new emails or app notifications, so when you pick up your tablet it’s ready to go and up to date. Fire HDX supports the latest-generation wireless standard 802.11ac, which is capable of a peak bandwidth of 600Mbps, 4x the peak bandwidth of the previous generation Fire HDX. Tablet keyboards have been frustrating to use because they work for typing but not for navigation, so you have to keep switching between typing on the keyboard and reaching up to tap the tablet display. Fire Keyboard solves this by including a trackpad within its incredibly thin and light design—it weighs just 7 ounces and is 4.8mm thin, 30% thinner than a #2 pencil. Fire Keyboard also includes Instant Search—just start typing and the search bar will appear, letting you search across your content libraries, Amazon.com, and the web. The keyboard connects magnetically to the new Fire HDX 8.9 Origami cover making it simple to carry and easy to remove if you aren’t using it—since the Fire Keyboard is detachable you can place it as close to or as far from the tablet as you’d like for the most comfortable typing position. The keyboard is available for $59.99—learn more at www.amazon.com/keyboard. The new Origami cover is nearly 20% lighter than the previous generation, and attaches magnetically so it’s easy to take on and off. The Origami design provides a stable stand for both portrait and landscape positions, and automatically turns the tablet on when it’s opened, and off when it’s closed. The cover features a custom slide feature that quickly exposes the rear-facing camera and automatically launches the camera application so you won’t miss a great photo opportunity. The cover is available starting at $54.99—learn more at www.amazon.com/origami. Fire HDX’s microUSB port is used not only for charging, but also to connect Fire HDX to your other devices. With the Amazon HDMI and VGA adapters you can connect Fire HDX to your TV, a computer monitor, or projector. With the Amazon USB adapter you can connect USB flash drives, SD card readers, or a wired keyboard or mouse. These are available at www.amazon.com/fire-accessories. Fire HDX is powered by the newest version of Fire OS—Fire OS 4 “Sangria”—which introduces hundreds of new and updated features. Fire OS delivers the most customer-friendly Android user interface—it starts with Android KitKat, and improves upon it by deeply integrating the hardware, platform, software, content, and the Amazon cloud. If an app runs on Android, it can run on Fire OS with little to no work. Read more: www.amazon.com/fire-os. Give everyone a personalized experience—each family member gets his or her own Profile, including individual email, Facebook and Twitter accounts, settings such as display brightness, page in the book, spot in a movie, and game levels, without taking up extra storage on the device for multiple copies of large files like videos and games. Never again worry about whose account has the Prime membership or who bought that book you want to read. Family Library links your Amazon account to that of your spouse or partner so you can easily share apps, games, audiobooks, books, and Prime Instant Video content within your household without changing accounts. Family Library lets family members share their content while using a single Fire tablet with different profiles, or across multiple devices—including Kindle e-readers, Fire tablets, Fire phone, and Amazon Fire TV—as well as on all of the other most popular devices and platforms with the free Kindle, Audible, and Amazon Instant Video apps. Available for the first time on a tablet, Firefly combines Amazon’s deep catalog of physical and digital content with image, text and audio recognition technologies to quickly identify web and email addresses, phone numbers, QR and bar codes, plus over 100 million items, including movies, TV episodes, songs, and products. Simply tap on Firefly in the Quick Settings menu to use Firefly for text, songs, videos, products, and more. You shouldn’t have to wait 10 seconds for a video to buffer after you press “Play”—it should start immediately. The new ASAP feature predicts which movies and TV episodes you’ll want to watch and prepares them for playback before you even tap play. This feature is smart—the caching predictions get better over time, so ASAP will continuously improve as you use your tablet. On Fire HDX, simply hit the Mayday button in quick actions and an Amazon expert will appear via live video to co-pilot you through any feature on the device. Amazon experts are able to draw on the screen, talk you through how to do a task, or do it for you—whatever works best. Mayday is available 24x7, 365 days a year, and it’s free. Amazon’s response time goal for Mayday is 15 seconds or less. Fire HDX comes pre-loaded with WPS Office, the most popular Android Office app with over 245 million customers and 250,000 five-star reviews. This lets you create, edit, and view Office documents, and is fully compatible with Microsoft Word, Excel, and PowerPoint. WPS Office also integrates with Cloud Drive, so Office documents created or edited on Fire HDX are automatically backed up and available through the Cloud Drive app on other mobile devices and computers. Over 200,000 movies and TV episodes—stream or download, purchase or rent. Tens of thousands of popular movies and TV episodes are available at no additional cost for Prime members with Prime Instant Video, the exclusive subscription streaming home to shows like Downton Abbey, Extant, 24, Dora the Explorer, Blue’s Clues, and many more. Prime Instant Video is also the exclusive online-only subscription streaming home to award-winning HBO original shows such as The Sopranos, Boardwalk Empire, The Wire, Six Feet Under, and many others. Over 300,000 apps and games in the Amazon Appstore, including the most popular titles like Facebook, Netflix, iHeartRadio, Twitter, Angry Birds Stella, Minecraft: Pocket Edition, and more. Apps are tested for the Amazon Appstore and Fire tablets. Millions of songs—purchases are stored for free in the cloud for access anytime, anywhere. Prime Music—unlimited ad-free access to over a million songs and hundreds of custom-built playlists. Download songs from the Prime Music catalog for offline playback. Free with Amazon Prime. Hundreds of magazines and newspapers are available for a free trial subscription, including popular titles like People, Vogue, Better Homes & Gardens, Sports Illustrated, Entertainment Weekly, The Washington Post, The Wall Street Journal, and many more. Millions of books, including hundreds of thousands of titles that are exclusive to the Kindle Store. Over a million titles are $4.99 or less, over two million are $9.99 or less. Kindle Unlimited—enjoy unlimited reading of over 700,000 books and unlimited listening to a selection of thousands of audiobooks for just $9.99 a month, including Flash Boys, Diary of a Wimpy Kid, and Life of Pi. Over 150,000 professionally-narrated audiobook titles from Audible, with free samples to listen to before buying. Fire HDX 8.9 is $379. It is available for pre-order starting today at www.amazon.com/hdx and will start shipping in October. 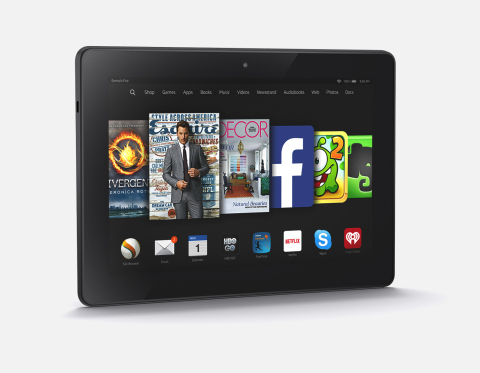 The 4G version is $479—you can pre-order today at www.amazon.com/fire-hdx-8.9-4g and it will begin shipping in October. Fire HDX 7 will continue to be available and will receive the Fire OS 4 update with many of these features later this year. Order today at www.amazon.com/fire-hdx-7 for just $199. Amazon also today introduced the new Fire HD which comes with a stunning 6” or 7” HD display, quad-core processor, Dolby Digital Audio, front- and rear-facing cameras, and an incredibly reliable design—and starts at just $99. Order today at www.amazon.com/fire-hd.